After a delayed flight from Delhi, I arrived at the Rock Garden late at night, after it was closed (not something I planned or recommend). I was met in the dark parking lot by Shifa, a local artist volunteer, and her volunteer helper, who bravely lugged my whale of a bag. 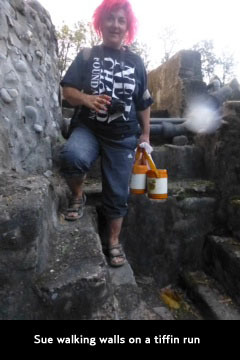 Torches in hands, they led me to my accommodation in the Waterfall House. Volunteer life at the Rock Garden is a bit like living inside a computer action game. The adrenaline level is similar, too--shimmying up walls (sometimes accompanied by a woman in a sari and heels); dodging monkeys and packs of feral dogs; a huge dead fruit bat floating in the canal that feeds the waterfall under our house; drinking tea from a curbside tea walla’s reused/rinsed cups. Certain sections of the walls became slippery when wet. 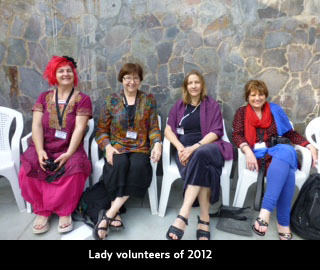 A good degree of fitness, problem solving ability, and lack of fear are necessary traits for Rock Garden volunteers. 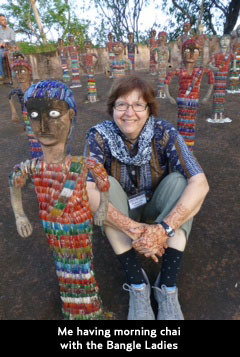 Each volunteer met Mr. Nek Chand within a day or two of arrival. He was a very busy man, with lots of people trying to see him and had the respect of every garden worker. We discovered that he was the decision maker for most things. I was warned that the living conditions would be “a lot like camping.” Coming from the mountains of Southern Oregon and being a former Girl Scout I went prepared for anything and used everything I took with me. We did not have a cook as groups did in previous years. Our meals were delivered several times a day in tiffins--funny little plastic lunch buckets with a tall stack of covered metal dishes clipped together inside. Mid-morning we phoned the tiffin walla to inform him how many meals we would need for lunch and dinner that day and the following day for breakfast. To pick up the evening meal delivery, which generally arrived in the dark between 7:30 and 9:00, we needed the headlamps that most of us had the foresight to bring. For safety reasons we always did this in pairs. All meals were more or less the same: chapattis (flat breads) , rice (except with breakfast there was yoghurt), a curry (with different veggies each time, at breakfast just a spicy sauce), lentil dal, and a small bag of pared raw “salad”, usually red carrots and daikon. After two days the pattern was set and a bit boring. We cancelled the breakfast tiffins and opted to make our own. The only stove in our kitchen was an electric hot plate. We did have a small refrigerator. It all worked well—when we had electricity. Occasionally we declared a tiffin-free day and fended for ourselves. Bathing Indian-style requires a large bucket, a pitcher, and a short plastic stool. We had to purchase the stool. You put warm water in the bucket, sit on the stool (close to the floor drain is good) and pour water over yourself, suds up, rinse and repeat. When done, use a long-handled squeegee to clean up the bathroom and push the water to the drain. We washed all of our laundry by hand, and dried it on a line we hung in the area outside our front door. When we first arrived at the garden in mid-February it was cool, cloudy, and rained occasionally. It took several days to dry. The weather changed after we were there about two weeks (the beginning of March)—it became warmer and sunnier. Clothes dried the same day. As we settled in we looked for things that needed doing. We picked up litter and talked to garden visitors. Four of us decided that a concrete structure with lots of blank columns in Phase 3 was a likely area for us to work. 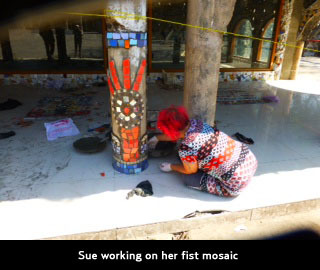 We took photos, drew a few designs, and got approval from Mr. Chand, had some tile sticking and cement mixing lessons, found materials, and Rakesh was assigned to help us with our needs. Of course it wasn’t that quick and easy, but that is another story. By the time we were actually ready to begin, two weeks had elapsed. 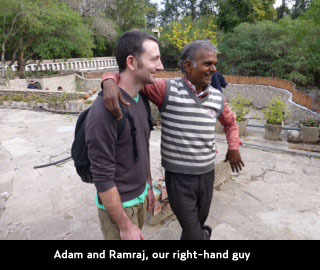 The frustrations, discomforts, and roadblocks in India and the Garden are many. Although our group was comprised of very strong, flexible, creative, tolerant individuals, we found that we each had a breaking point. An interesting phenomenon is the Indian people’s interest in western visitors. People came up to us wherever we went, talked to us, asked questions, and wanted to photograph us. Our last afternoon at the Garden, after we had cleaned up our mosaic site, we walked around the plaza in Phase 3, saying goodbye to our friends and coworkers: we photographed each other and exchanged email addresses and phone numbers. A handsome uniformed guard asked if someone could photograph him and me using his cell phone. He told me, “You are my favorite mam.” Even the juice vendor’s 12-year-old son asked me to come back next year. It was really sad to leave.